The topic of today’s column is probably the most frequent issue every vet, animal owner, worker and rescuer faces in Cambodia, namely parasites infestation. And while there are so many I could discuss today – both internal (gastrointestinal) and external (fleas, ticks) – I prefer to address the issue of ticks and how the parasite affects our pets and other animals’ health and well-being. But only two families of ticks are common here in Cambodia. Ticks transmit diseases to both humans and animals when microbes in their saliva and mouth secretions get into the host’s skin and blood. Those of us who lived in Cambodia long enough have seen street animals infested with these blood suckers. They attach themselves to host animals, feeding on their blood for weeks or months. Any dog can be affected by ticks if not properly protected. And here in Cambodia, ticks are unfortunately everywhere – on the streets and in grassy areas. Ironically though, many of the pet owners I meet often say that they know about ticks but are not too concerned because they do not see them on their pets. Ticks are too small, making it hard for people to detect them in their animals’ thick fur. And the sad reality is, it only takes one tick to make your dog sick – often chronically, sometimes fatally. I and other pet parents living in Cambodia have our fair share of battles with ticks, too. We often face the inevitable and harsh reality that our pets can fall ill with tick-borne diseases commonly referred as “tick fever”. I spoke to many veterinarians and they all seem to agree that dogs that do not get proper protection from their owners are highly vulnerable to tick fever. Dr. Lauren Marsden of VSL Veterinary Clinic said that her clinic receives at least two cases of tick-borne diseases weekly. In some cases, the dogs brought to vet clinics are already in the last stages of the disease. The death of these dogs become not only probable but a heart-crushing reality for the pet parents and veterinarians who try to save them. So, before we put ourselves and our pets into this painful situation, let us keep ourselves well informed. The symptoms of tick fever vary from animal to animal and often go undetected until it’s too late. Commonly, the symptoms are lethargy, swollen lymph nodes, fever, weight loss, anorexia, neurological problems and bleeding disorders. In late stages, when the disease becomes chronic, more serious complications such as anemia, eye hemorrhage, low platelets (inadequate production of platelets, which allow blood to clot), and even bone marrow failure come out. So what do we do to avoid it? I have three suggestions: prevention, prevention, and prevention! Protect your animal from being a host to ticks. 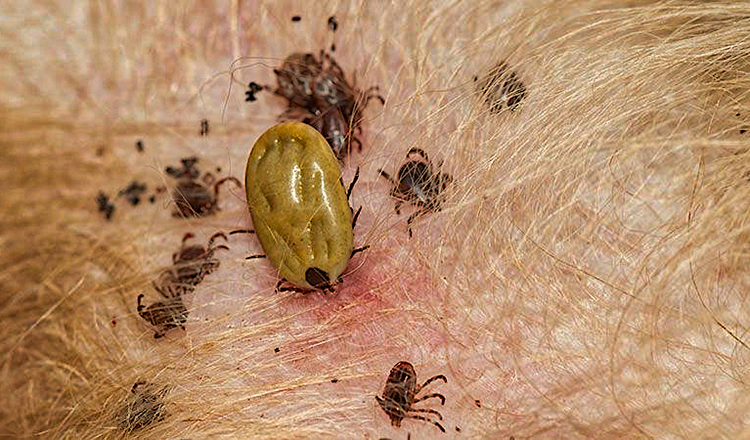 There are many products available in the market that will prevent and kill ticks before they can transmit the disease into the animal’s blood stream. But beware. Not all of the products available in the market are safe for your pets. Some products are highly toxic and although they do kill the ticks, they also damage the animals’ vital organs. It is absolutely important that you speak to trusted veterinarians before injecting or washing your animals with anti-parasite solutions. At Animal Mama, we have seen cases of dogs that have been given anti-tick baths by their owners who either did not dilute the highly toxic solution enough or did not dilute it at all. These cases often lead to poisoning or death. There are both natural and veterinary products that are proven to be safe and effective against ticks. I personally use a natural mixture of apple cider vinegar and water spray. While it does not kill ticks that have already buried their heads into your dog’s blood stream, I found it effective for preventing ticks from climbing on the dog. The smell of the apple cider vinegar is unpleasant to parasites, so they move out and find a new host. Other products that seem to have veterinary safety consensus are Preventic and Seresto collars. Both products have active medical ingredients, which are distributed over the pet’s entire body surface. Low doses of the ingredients are released from the collars and absorbed through the fatty layer of the skin and hair. However, be careful in buying these tick collars as many counterfeit products are sold everywhere. I have personally seen rare but significant cases of allergic reactions from the fake treatment collars. Dr Charlotte Søyland was the first person to tell me about the product for my dogs. A combination of this treatment, apple cider vinegar solution and the Serestro collar has so far made our large canine family healthy and tick-free. My final recommendation is pay attention to your animal and the changes in their behavior. If you see that something is “off” with the way your pet is acting, please seek veterinary care immediately, do necessary tests and treat the animal before it is too late. And first and foremost, do yourself, your pet and also your wallet a favor: talk to your vet about prevention: it is much cheaper, easier and surely more pleasant to regularly protect your animal than spending your energy, money and most importantly emotional health watching your beloved pet fighting easily preventable diseases. 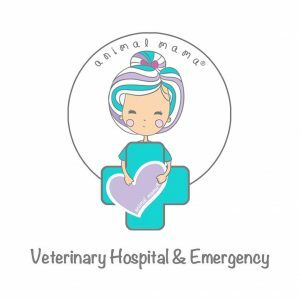 Animal Mama® Animal Clinic & Welfare Centre provides a wide range of services for animals & pets: vet care, boarding, daycare, pet food & supplies, hydrotherapy, grooming and doggy play dates. 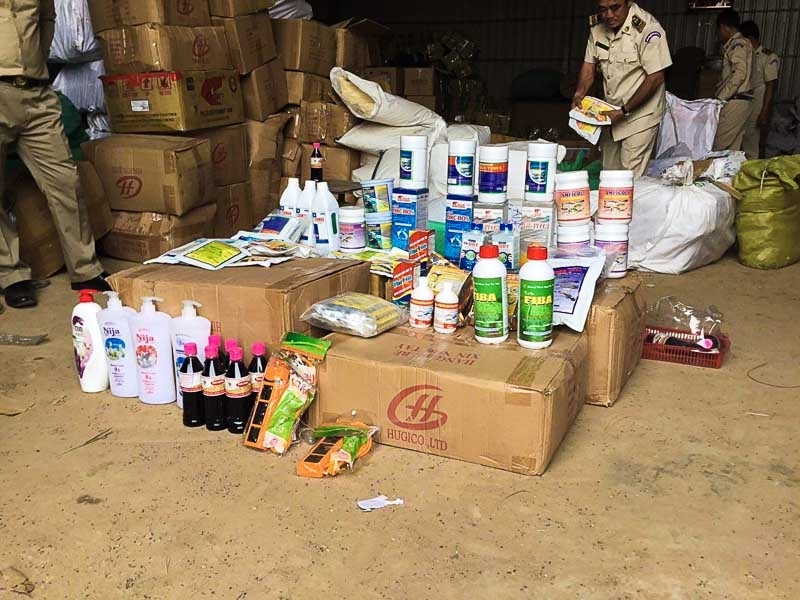 Forces find potentially dangerous goods at warehouse. Supplied. Notre Dame is more than just a cathedral. That’s why we should welcome, rather than criticize, the donors pledging vast sums to help rebuild this unique edifice, writes DW Editor-in-Chief Ines Pohl.